Fun idea, Linda! Looks like we were on a similar page today. Glad you enjoyed your event and gots a lot of stamping in too! How fun...the card and the shoebox swap. I did one last year with 16 stations and what a job that was! It is quite a task, huh? 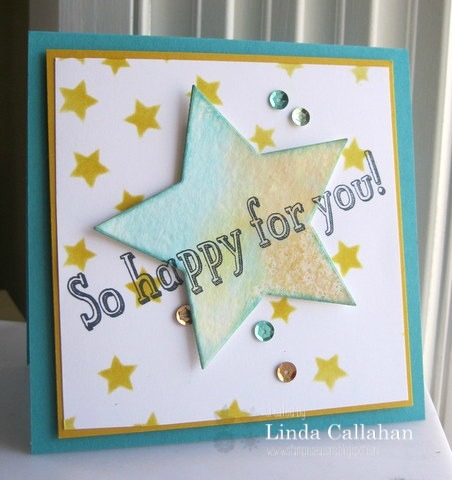 Love the watercolor washed star! I love the colors on the star! Sounds like you had a great time. Hopefully you will be sharing more of the techniques that you learned!! I love how that star turned out. And I'm not even going to ask how you did the sentiment that way and got it perfectly lined up. That's the sort of thing that would take me hours to do! Inspirational take on the sketch, Linda! Fabulous card and a cool technique.